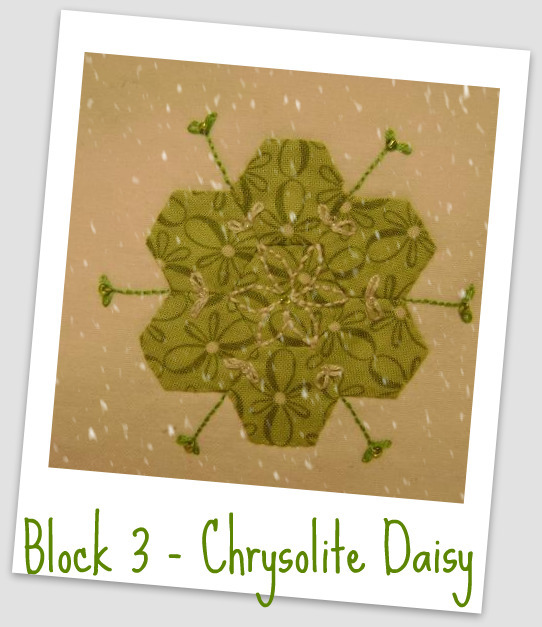 As sweet as cinnamon: Green Snowflakes? and sparkly as a snowflake! Dawn .. I've been waiting with baited breath all day - can you guess what I'll be doing tonight :) I've appliqued all my hexagons and look forward to Wednesdays like I never have before! Thank you! Love it ! The green is gorgeous! Will start on it tomorrow! Oh, this green one is so pretty. I have finished one block so far. ps I came from Cyndi's today. Since green is my favorite color I think green snowflakes are beautiful. Thank you for sharing this wonderful BOW with us all! GORGEOUS!!!!! These are the kind of snowflakes I don't mind seeing in August, lol - thanks Dawn! I have to tell you when I saw that green my first thought was green tomato salsa...........lol! too many tomatoes on the brain. almost done will email you soon, had to pick and work more tomatoes tonight. tomorrow evening at the first meating for the new season in our club. Oops, I hadn't noticed that two more flakes are out already. A lovely project, Dawn! I just posted my first flake! Thank you for letting us have the fun to make this! I stumbled upon this a couple days ago and love this project. One question: is the white background the same for every block or scrappy? Would it look right as scrappy or should I go solid? Thank you! Dawn, this is so pretty. Each one so far looks so different. It's such a lovely combination of colours. By the way, I tried the links you gave us for the hexagons but I couldn't get onto the site. I'll try again in case it was just a blip - one of many on my computer...haha! Please ignore my last comment, I've just successfully got onto Vicki's page. 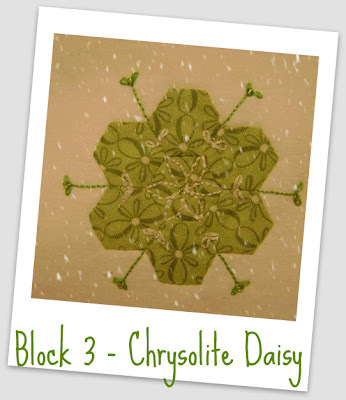 Very beautiful hexie snowflake...I LOVE it!